We have received 230 reviews of The Explorer . You can add a review or scroll down to read reviews. To send in your review of The Explorer , please fill in the info below and click the button labelled Send Review Now. Reviews will be checked by our team before they appear on the website. Your last name will not appear on the site, but we need to know who you are in case you win a prize! The Boy with One NameThe Dragon with a Chocolate HeartJust Call Me Spaghetti-Hoop BoyLetters from the LighthouseWho Let the Gods Out? Born in Kent, Katherine spent time in Zimbabwe, where her father was a diplomat. She later moved to Brussels, then London. She studied at Oxford and developed an interest in roof-top climbing. Her first book, The Girl Savage, was published in 2011 and had influences from Zimbabwe in it. Her second novel, Rooftoppers, won the Waterstones children’s book prize in 2014 and also the Blue Peter award. The Explorer is her fourth novel. It is based in the Amazon Jungle where Katherine fell in love with the beauty of the place. She wanted children to realise that they can be explorers anywhere by paying attention to their world. She explains that the book can be summed up by one line spoken at the end of the novel “You are right to be afraid, be brave anyway”. From his seat in the tiny aeroplane, Fred watches as the mysteries of the Amazon jungle pass by below him. He has always dreamed of becoming an explorer, of making history and of reading his name amongst the lists of great discoveries. If only he could land and look about him. As the plane crashes into the canopy, Fred is suddenly left without a choice. He and the three other children may be alive, but the jungle is a vast, untamed place. With no hope of rescue, the chance of getting home feels impossibly small. Except, it seems, someone has been there before them. Katherine claims to start every day with a cartwheel as “Reading is almost exactly the same as cartwheeling; it turns the world upside down and leaves you breathless”. She is now a full-time writer and a Fellow of All Souls College, Oxford, where she studies Renaissance literature and climbs old buildings at night. I loved this book so much I couldn’t put it down. I was lost in all the adventures in the amazon jungle. Maizy gave The Explorer 4 out of 5 and now plans to read The Boy with One Name by J R Wallis. Pola gave The Explorer 5 out of 5 and now plans to read Letters from the Lighthouse by Emma Carroll. I loved this book because of the rainforest and I love sloths. Brooke gave The Explorer 5 out of 5 and now plans to read Just Call Me Spaghetti-Hoop Boy by Lara Williamson. Laibah gave The Explorer 5 out of 5 and now plans to read The Boy with One Name by J R Wallis. i really like that it was set in the jungle and not in a typical place. Nicole gave The Explorer 5 out of 5 and now plans to read The Boy with One Name by J R Wallis. I liked this book because it gave a lot of detail and it was exciting. My favourite part was when the girl found a koala. My favourite character was Fred because he was very adventurous. Ephraim gave The Explorer 3 out of 5 and now plans to read The Boy with One Name by J R Wallis. This book was really gripping, and definitely deserves a 5/5! I personally think Con is the best character, attitude and everything! It is a heartwarming adventure, staring the famous Amazon Rainforest, and a little bit of humour! I will recommend this to adventure loving people, and who have a passion for nature. If I saw this in a bookstore, I would totally purchase it!!!! Daisy gave The Explorer 5 out of 5 and now plans to read Just Call Me Spaghetti-Hoop Boy by Lara Williamson. I loved this book and I thought that it was very exciting and interesting. I think it is the best book of the shortlist, however I thought that the last part of the book was quite rushed and crammed into only 30 odd pages. This was disappointing , because I was looking forward to finding out if they are okay. Apart from that it was very good. Kate gave The Explorer 4 out of 5 and now plans to read The Dragon with a Chocolate Heart by Stephanie Burgis. this was a awesome book about kids in a rainforest. the only thing I didn't like that the start was a bit rushed. Anand gave The Explorer 4 out of 5 and now plans to read The Boy with One Name by J R Wallis. I enjoyed the book because I like adventures books I also love all different types of adventures stuff ????????????????????????????????????????????????????? Lacey gave The Explorer 5 out of 5 and now plans to read The Boy with One Name by J R Wallis. I love ? it because its about exploring and I love ? exploring-your book ? is so amazing I LOVED it I hope ? u write another exploring book ? 123 I love ? it!!!!! korenza gave The Explorer 5 out of 5 and now plans to read The Boy with One Name by J R Wallis. This book is amazing because there is loads of action and your eager to find out what happens next. I felt like i was actually in the Amazon Jungle with all of the characters and the baby sloth. I would definitely recommend this book for people who like adventures, action and a bit of sadness. Emily gave The Explorer 5 out of 5 and now plans to read The Boy with One Name by J R Wallis. This book was very boring and it dragged on a little bit. What I liked about this book was that it was full of adventures. I would recommend this book for people that like adventurous books. Harriet gave The Explorer 3 out of 5 and now plans to read Letters from the Lighthouse by Emma Carroll. I really enjoyed this book, I would say it is the best book out of all six! I will give this book 5 out of 5 because I liked the idea of writing books about people stranded in a jungle! Mackenzie gave The Explorer 5 out of 5 and now plans to read The Dragon with a Chocolate Heart by Stephanie Burgis. It's an amazing book with lots of action. I love the book! I couldn't have chosen a better book to read. This book is better for older children because it's quite a big book. It is very enjoyable. It's AWESOME! Freya gave The Explorer 5 out of 5 and now plans to read Who Let the Gods Out? by Maz Evans. This book was awesome,it made me want to live in the amazon. My favorite characters were probably Max and the explorer as they were both funny(Max) and interesting(Explorer). This was by far my most enjoyed book. Tormaigh gave The Explorer 5 out of 5 and now plans to read Just Call Me Spaghetti-Hoop Boy by Lara Williamson. This book is my favourite one; it has so much vocabulary and good description! I like how you gradually get to know the characters and about their back story! Normally these people wouldn't really meet, though in this particular situation they did and became friends! Charlotte gave The Explorer 5 out of 5 and now plans to read Just Call Me Spaghetti-Hoop Boy by Lara Williamson. I loved this book because I could easily visualise what's happening in the chapters.The only thing I would like to add to this book is that I wish that it would say at the end who the explorer is and what happens at the end I wont say because I don't want to spoil the story.But other than that it was really good.Well done. Bela gave The Explorer 5 out of 5 and now plans to read Letters from the Lighthouse by Emma Carroll. I really enjoyed this book. It had a great way to encourage people to work together. I really enjoyed reading this book and would deffinetley read it again. Kara-Leigh gave The Explorer 4 out of 5 and now plans to read Who Let the Gods Out? by Maz Evans. I loved this book. It was beautifully written and had me laughing out loud! Abigail gave The Explorer 5 out of 5 and now plans to read Just Call Me Spaghetti-Hoop Boy by Lara Williamson. This book was very adventurous and full of mystery with points of suspense. It was very unique. It wasn't very clear to me about what was happening at the end. I think that I would recommend it to people who are patient when reading due to the suspense. Katie gave The Explorer 4 out of 5 and now plans to read The Boy with One Name by J R Wallis. Rhianne gave The Explorer 4 out of 5 and now plans to read Just Call Me Spaghetti-Hoop Boy by Lara Williamson. i enjoyed the book very much because of all the animals. it was very entertaining and very details. i gave it 4 stars because i engorged.i was amused. lillie gave The Explorer 4 out of 5 and now plans to read Just Call Me Spaghetti-Hoop Boy by Lara Williamson. this was an amazing book with twists and plots. it was an adventure and I loved it. izzy gave The Explorer 5 out of 5 and now plans to read The Boy with One Name by J R Wallis. This book was about siblings who got stranded in a jungle.They were fighting against all odds trying to survive on their own.My favourite part was when they found a sloth and named it Abacaxi. How ever I didn't like it when the book kind of repeated it's self over again. I would recommend this book to a person who likes Bear Gryls because they were like Bear Gryls because they were building a raft and fighting for food. Ruby gave The Explorer 5 out of 5 and now plans to read The Boy with One Name by J R Wallis. This book is exciting and adventurous. I like this book because it is filled with adventure and cliff-hangers. I would recommend this book to anyone who likes adventure. Grace gave The Explorer 5 out of 5 and now plans to read The Boy with One Name by J R Wallis. Lukas gave The Explorer 5 out of 5 and now plans to read The Dragon with a Chocolate Heart by Stephanie Burgis. I liked this book because it was heartwarming and adventurous. The story emphasised how important it is to work together in hard situations m.
Hannah gave The Explorer 3 out of 5 and now plans to read Who Let the Gods Out? by Maz Evans. I gave this book 3 out of 5 because I found it too long to get into the story. It doesn't explain enough about the characters at the beginning and it's quite difficult to understand what's going on. I would recommend this book to people who love to explore. Millie gave The Explorer 3 out of 5 and now plans to read The Dragon with a Chocolate Heart by Stephanie Burgis. Samuel gave The Explorer 5 out of 5 and now plans to read Who Let the Gods Out? by Maz Evans. This book is so fun and it also encourages families to go outdoors and enjoy life without technology. Ava gave The Explorer 5 out of 5 and now plans to read Just Call Me Spaghetti-Hoop Boy by Lara Williamson. This book was brilliant and exciting I loved it so much I would read it again and again and again well done Katherine! Lara gave The Explorer 5 out of 5 and now plans to read The Boy with One Name by J R Wallis. I thought this book was very interesting, I thought the characters were very determined to fight for their lives living in the amazon. The four people,who were called Fred, Lilia,Max and Con, were flying in a plane but suddenly they flew into a cloud of smoke so the driver, who was driving the plane couldn't see so they all crashed landed in the Amazon only those four people were alive. After a couple months fighting for their lives they found this man. The man did not tell them his name but helped looking after them. But one morning they found Max screaming in pane The Man said he needed to go to the hospital and showed them his plane and they all flew back with Fred flying the plane and all of them managed to get home with out crashing. After reading this book I felt relieved and impressed that all four of them manged to stay alive in the Amazon. Abigail gave The Explorer 5 out of 5 and now plans to read The Dragon with a Chocolate Heart by Stephanie Burgis. This book was GREAT. I really enjoyed the last one hundred or so pages due to all the excitement and the thrill of it. I would like to ask one question:when was it set? Benedict gave The Explorer 5 out of 5 and now plans to read Just Call Me Spaghetti-Hoop Boy by Lara Williamson. The Explorer is an amazing book, perfect for adventure lovers. It is about 4 children called Fred, Con, Max and Lila. I really enjoyed this book because it really got your heart beating and made you want to turn every page to find out what happened next. I enjoyed this book because it was all about mystery and drama and was a page turner. The story gripped me and I could not put it down. I really enjoyed this book because it really got your heart beating and made you want to turn every page to find out what happened next. I enjoyed this book because it was all about mystery and drama and was a page turner. The story gripped me and I could not put it down. I really like this book and how all the characters have their own personality when you read some books you read the personalities are all the same. I love all the twists and turns. Jessica gave The Explorer 5 out of 5 and now plans to read The Boy with One Name by J R Wallis. A good and intense book when some children- Fred, Max, Lilly and Con try to escape the jungle when Max becomes very unwell.They also decide to meet up 10 years later.do you think they do? Gus gave The Explorer 5 out of 5 and now plans to read Letters from the Lighthouse by Emma Carroll. Danny gave The Explorer 5 out of 5 and now plans to read The Boy with One Name by J R Wallis. I really enjoyed this book because all the characters have really strong personalities. I also liked it because it helped me create a clear picture in my mind. Over all i give this book a 4 out of 5. Danielle gave The Explorer 4 out of 5 and now plans to read The Dragon with a Chocolate Heart by Stephanie Burgis. I really like this book and how all the characters have their own personality when you read some books you read the personalities are all the same.I love all the twists and turns. Anjali gave The Explorer 5 out of 5 and now plans to read The Boy with One Name by J R Wallis. exciting, dangerous and a little crazy. Ellen gave The Explorer 5 out of 5 and now plans to read Who Let the Gods Out? by Maz Evans. I really enjoyed this book because it really got your heart beating and made you want to turn every page to find out what happened next.I enjoyed this book because it was all about mystery and drama and was a page turner.The story gripped me and I could not put it down.After reading this book it made me want to read more books by Katherine Rundell. This book makes you think it's real which is every authors intention. Grace gave The Explorer 5 out of 5 and now plans to read The Dragon with a Chocolate Heart by Stephanie Burgis. The Explorer is an amazing book, perfect for adventure lovers. It is about 4 children called Fred,Con,Max and Lila. They are setting out on a plane journey to Manaus - a city on the path of the river Amazon, when their plane suddenly crashes into the wilderness below.Certain that no one but them is alive from the crash they journey into the jungle cooking grubs to eat and drinking out of cesspools.After some time in the Jungle they come across and old map inside a red tobacco pouch.They follow the map through the jungle until they find themselves in a mysterious ancient city.The book is full of excitement as well as a hole range of emotions.I would recommend this book to readers over 9 as some parts can be quite frightening. Amelia gave The Explorer 5 out of 5 and now plans to read The Dragon with a Chocolate Heart by Stephanie Burgis. recommend it to people who like to read. Daisy gave The Explorer 5 out of 5 and now plans to read Letters from the Lighthouse by Emma Carroll. I rate this book a three because i like it when the explorer finds the children i recommend this book to people who like happy endings. Mazey gave The Explorer 3 out of 5 and now plans to read The Boy with One Name by J R Wallis. Katy gave The Explorer 4 out of 5 and now plans to read The Boy with One Name by J R Wallis. I would rate this book a 5 out of 5! I am rating it that because it is such a adventurous book and I couldn’t stop reading it during class! My favourite character is Lila because she looks after everyone! Ava gave The Explorer 5 out of 5 and now plans to read The Boy with One Name by J R Wallis. carmen gave The Explorer 5 out of 5 and now plans to read The Boy with One Name by J R Wallis. Eva-Josefine gave The Explorer 5 out of 5 and now plans to read The Boy with One Name by J R Wallis. This book was a bit boring at first but as i read it more it became more interesting. As the book was adventurous I enjoyed it because I am really adventurous. Louise gave The Explorer 3 out of 5 and now plans to read Who Let the Gods Out? by Maz Evans. I love this book so much I rated it five out of five.It is full of adventure and its really dramatic.Although i'm not really interested in jungles and adventures I still am interested in it. I will recommend this to anyone who loves exploring. Fiona gave The Explorer 5 out of 5 and now plans to read The Dragon with a Chocolate Heart by Stephanie Burgis. This book is about four kids who go on a plane but it crashes. Max Con Fred and Lila need to survive in the Amazon and they are helped by an explorer. Unfortunately I did not like this book because there was not enough of the story to create a clear picture in my mind. Along with this there was not enough description. Although this wasn't the book for me I could relate to Lila because she was caring for her brother and I care for all three of my brothers. I would recommend this book for people who like adventure stories. kaitlin gave The Explorer 2 out of 5 and now plans to read The Boy with One Name by J R Wallis. I thought this book was fantastic because it was full of excitement and adventure. It gives the reader a look into what it would be like trying to survive in the Amazon jungle. I liked the ending. Jasmine gave The Explorer 5 out of 5 and now plans to read Letters from the Lighthouse by Emma Carroll. Ruby gave The Explorer 4 out of 5 and now plans to read The Boy with One Name by J R Wallis. I loved this because it is an adventure and it has LOTS of drama. My favourite character would be Fred since he is a born leader and is extremely funny.I would rate this book 5/5 since I couldn't put the book down after reading the first chapter. I would give this to a 9 year old or older because younger children wouldn't understand some of it. Freya gave The Explorer 5 out of 5 and now plans to read Just Call Me Spaghetti-Hoop Boy by Lara Williamson. It took me into another world, into the Amazon. It was very sad and funny and I liked it when the children flew away in the plane. Harry gave The Explorer 5 out of 5 and now plans to read Who Let the Gods Out? by Maz Evans. I loved this book yet I have read better. It was very adventurous with lost of bits I loved, yet the ending was a bit boring. A normal ending everyone would of thought of. Abigail gave The Explorer 2 out of 5 and now plans to read The Dragon with a Chocolate Heart by Stephanie Burgis. This book was okay. It was a bit boring to start with but when you got into it it was really good. So if you want to read this book go for it! Millie gave The Explorer 3 out of 5 and now plans to read The Boy with One Name by J R Wallis. I like the book because its an adventure book and i like adventure books because they are really good and has lots of describing words in it about the adventure. The reader has used really good words about the book. MAKE SURE YOU READ THE BOOK ITS AMAZING?? Jessica gave The Explorer 5 out of 5 and now plans to read The Dragon with a Chocolate Heart by Stephanie Burgis. This book was fantastic. The story was wonderful and the characters were just amazing. My favourite characters were Con, because of her feisty attitude, Max, because of his quirkiness an of course Abacaxi (Baca). The detailed descriptions in this book let me picture the scenery and the appearances of the characters with ease. I love how 'the explorer' cares about and protects Max. It is heart-warming how he keeps this ill boy from danger by allowing Fred to fly his beloved aeroplane to Manaus. The ending to this book couldn't have been more perfect. I do recommend this book to anyone and would love to read another novel by Katherine Rundell. Isabel gave The Explorer 5 out of 5 and now plans to read The Dragon with a Chocolate Heart by Stephanie Burgis. The Explorer is a very interesting and enjoyable book. I love how detailed it is and how easy it is to picture the scenery and the appearance of all the characters. My favourite characters are Con because of her attitude, Lila because of how she stands up for Max in some parts and of course Abacaxi (Baca the baby sloth) because of his cuteness. I would definitely recommend this book to anyone and I would love to read more from Katherine Rundell. Violette gave The Explorer 5 out of 5 and now plans to read The Boy with One Name by J R Wallis. this book took me on a roller coaster of excitement whilst uncovering amazing mysteries. this is all I can say; that's how amazing this book is! ALEESHA gave The Explorer 5 out of 5 and now plans to read Just Call Me Spaghetti-Hoop Boy by Lara Williamson. This book has dragged me through a rollercoaster of emotions. My favourite character was definatley Fred as in the beginning he just dealt with Cons backchat and the twins mischief. Although this book was a little long, it was still intriguing enough to pick it up and have a NICE lONG READ. Ellie gave The Explorer 5 out of 5 and now plans to read The Dragon with a Chocolate Heart by Stephanie Burgis. This book is about a boy called Fred.He and 3 other children were in a plane and they crashed and found a mysterious jungle/amazon.They are not the only ones there.My favourite character was Fred because he was very adventurous.The full story felt like it was in front of me.This story kept me guessing and made me keep turning the pages.My favourite part of the book was when the met the person who had already been there.The certain types of scene that were written particularly well were mysterious ones.This book definitely gripped me.I don't think that I disliked any part of the book at all.I would want a second book like part 2.I would recommend this book to people who like adventurous books. Riya gave The Explorer 5 out of 5 and now plans to read The Boy with One Name by J R Wallis. Alistair gave The Explorer 5 out of 5 and now plans to read Letters from the Lighthouse by Emma Carroll. this book has too much detail and if i were you i wouldn't eat tarantlers but i'm glad max got well again i think they are all they were all thery brave. To be honest i would like to be in the plane myself. Scarlett gave The Explorer 3 out of 5 and now plans to read Letters from the Lighthouse by Emma Carroll. The Explorer was a captivating jewel of a book. I would recommend this book to anyone; it was interesting, funny and factual. I would love to go to the jungle myself after reading this beautiful book! I rate The Explorer a 5. Maisy gave The Explorer 5 out of 5 and now plans to read The Boy with One Name by J R Wallis. This was a sooooooooo good book!!!!! !I enjoyed every bit of it from the description to the characters.My favourite was Con because she was sassy and very funny.Overall,I recommend this book for anyone who is ready for a amazing Amazon adventure. Jacob gave The Explorer 5 out of 5 and now plans to read The Boy with One Name by J R Wallis. I didn't enjoy this book too much because it didn't excite me. I liked that it taught me about Greek gods, it was very knowledgeable and it was quite exciting. The story didn't really keep me guessing because it was quite straight forward and boring. I didn't like the main character because he was just a normal boy and nothing really interesting. I would rate this 2 out of 5 because the setting didn't interest me. Mackenzie gave The Explorer 2 out of 5 and now plans to read The Dragon with a Chocolate Heart by Stephanie Burgis. Great great vocabulary and exciting. Rylan gave The Explorer 5 out of 5 and now plans to read The Dragon with a Chocolate Heart by Stephanie Burgis. i really enjoyed reading this book it is now my favorite book.As i read this book i could picture it in my head.It was an interesting book and the author put lots of detail into the characters personalities.My favorite character is Lila because she is very smart and adventurous. The explorer is a good character because he is very misterious and no one knows his name. This book is AMAZING Katherine! This is my absolute favourite! Full of Adventures. One of the funniest bits are where Max threatens to pee on anyone who wakes him up early. It's so amazing I just cannot tell you how fabulous it is. The whole world needs to read this book. Lily gave The Explorer 5 out of 5 and now plans to read The Boy with One Name by J R Wallis. I liked this book because it got you wanting to read more and find out what happens to the four children. I only rated this book four because it is not the type of book I like to normally read. Sophie gave The Explorer 4 out of 5 and now plans to read The Boy with One Name by J R Wallis. this book is amazing it is the best book i have ever read in years!i would recommend the book "explorer". it is very heart warming my favorite part was when the children met the explorer i love the explorer because he teaches the children how to survive in the jungle. Katherine Rundell gave each child an extraordinary personality i especially liked brainy fred! i also really liked the part when freds' father gave him a hug at the end. chloe gave The Explorer 4 out of 5 and now plans to read The Boy with One Name by J R Wallis. I did not enjoy this book as much as the books before this. I just didn't think it was as exiting.It was funny a some points but boring at others.My favorite character was Con (Constantia)because she was cold at the start but then she got nicer and it was better then. It just wasnt a book that i would ever read again. Amelia gave The Explorer 2 out of 5 and now plans to read The Dragon with a Chocolate Heart by Stephanie Burgis. I didn't really like this book it wasn't for me but i still carried on reading. The bit I liked the most was where they built the raft. My favorite character has to be Con even though she is moody with Fred at the start but they begin to form a friendship.Over all I didn't like it but it had me gripped. Sophia gave The Explorer 3 out of 5 and now plans to read The Boy with One Name by J R Wallis. I really did love this book. I thought that it would take forever to read but it gripped me in so much that it only took me 2 weeks. I really liked the ending! Ella gave The Explorer 4 out of 5 and now plans to read The Boy with One Name by J R Wallis. This book is an epic adventure, it is thrill-seeking and fun. As you follow Fred's amazing adventure you roam the plains of the Amazon Rainforest, ride a raft on the river and go on a incredible plane journey to a city on the water. I recommend this book to anyone who enjoys action and adventure. I think this book would develop further with some more description about the surroundings and if the reader found out what the explorer's name was, as it would add some mystery to the this heart-warming tale. Tatiana gave The Explorer 5 out of 5 and now plans to read The Dragon with a Chocolate Heart by Stephanie Burgis. The book is amazing and i love the beginning but it just has too much detail for everything but other than that it was great. Rhianne gave The Explorer 4 out of 5 and now plans to read Letters from the Lighthouse by Emma Carroll. I loved this book as it is filled with adventure and funny characters. I like the little arguments she has put in the story as well, I will be reading this book again for sure! frankie gave The Explorer 4 out of 5 and now plans to read The Dragon with a Chocolate Heart by Stephanie Burgis. This book was soooo good; if you love adventure or want a change in the style of book you get to read. I really want to know more about Fred's dad and I really like how at the end there is part where it says 10 years later. This book is about 4 young children who's aeroplane crashes and they get lost in a forest. I love how there are funny bits, serious bits and sad bits. All around it is a really great book. Diya gave The Explorer 5 out of 5 and now plans to read Just Call Me Spaghetti-Hoop Boy by Lara Williamson. I think this book was amazing! but it could of been 100 pages longer and it would be even more amazing.It was a good book to read at night to get me off to sleep and dream about the jungle. My mum started reading it and couldn't stop. But when i finished it my mum was halfway through! annabelle gave The Explorer 5 out of 5 and now plans to read The Dragon with a Chocolate Heart by Stephanie Burgis. a really good book my favourite so far but it was quite rushed at the end. you should do more as a series. #LOVEIT!!!!!!!!!! ife gave The Explorer 5 out of 5 and now plans to read The Boy with One Name by J R Wallis. james gave The Explorer 4 out of 5 and now plans to read The Boy with One Name by J R Wallis. daniel gave The Explorer 4 out of 5 and now plans to read Who Let the Gods Out? by Maz Evans. I LOVED this book. I couldn't stop reading it and would happily read it again. I really liked all of the characters, especially the animals. I would definitely rate this amazing book 5 out of 5. Katy gave The Explorer 5 out of 5 and now plans to read Just Call Me Spaghetti-Hoop Boy by Lara Williamson. Darcey gave The Explorer 5 out of 5 and now plans to read Just Call Me Spaghetti-Hoop Boy by Lara Williamson. I love this book! This is by far the best book I have ever read and I have read a lot of books from: adult books, adventurous books and fun books.I would read this book again and again and this is the best book ever! Sophie gave The Explorer 5 out of 5 and now plans to read Letters from the Lighthouse by Emma Carroll. This book was amazing, in fact it is one of the best books I have ever read. It is a book about four children who arrive unexpectedly in the Amazon Jungle, unready and unprepared... This book was a great read, and I would definitely recommend it to all children my age. I would also recommend it to anyone who likes stories of adventure. Caitlin gave The Explorer 5 out of 5 and now plans to read Who Let the Gods Out? by Maz Evans. I loved this book and thought it was very adventurous and intriging it made me want to read on after the first page I found it very exciting and my favourite character is Lila as she looks after Max (her little brother)very well, therefore I rate this book 5 out of 5!!! Isabella gave The Explorer 5 out of 5 and now plans to read Letters from the Lighthouse by Emma Carroll. I thoroughly enjoyed this fiction book, since it was full of adventure. It is one of the best books I have ever read and kept me intrigued throughout the book. Every page I read made me more determined to read on. It is when four young children: Lila, Con, Fred and Max crash-land into the Amazon Rainforest. They face many dangers and have had to risk their lives in many situations. I would strongly recommend this book to anyone who enjoys adventurous stories. I would definitely advise the author to keep on writing fiction books like this. Jennifer gave The Explorer 5 out of 5 and now plans to read Who Let the Gods Out? by Maz Evans. This book is about four children:Max,Fred,Lila and Con.They go on a plane but they crash and have to make their way out of the jungle,they get helped along the way by an explorer.I liked this book because I can imagine the children being real by all the descriptions about them.My favourite character is Con because when she doesn't want to do something she stands her ground when people try to make her and this book makes me laugh by how cheeky Max is. This story kept me hooked and I was eager to read more.I don't think this book could be improved because it is amazing. I would recommend this book to people who like adventure stories. Leigha gave The Explorer 4 out of 5 and now plans to read The Dragon with a Chocolate Heart by Stephanie Burgis. This book is honestly incredible my favourite character is Lila because she is taking care of her younger brother as well as feeling brave and I think this character can inspire girls who are not confident and think they are not good enough. She is also the most serious member of the group and in my friend group I am the most serious and I tell my friends what to do sometimes so this character relates to me a lot! Also this book taught me to always believe and anything is possible if you try. Indie gave The Explorer 5 out of 5 and now plans to read Letters from the Lighthouse by Emma Carroll. This book is about 4 young children who crash in the amazing Amazon. They have to leave the jungle to get back to their family's with help from an explorer. I have really enjoyed this book because it kept me reading. My favourite character is Max since he is really cheeky and we are really alike even though I am double his age. My favourite part was when they got help from the explorer. The book made me laugh a lot when Max did something silly or a pun. I don't think this book has anything wrong with it however I really want a sequel since it was so good. I recommend this book to all people who love adventures. Callum gave The Explorer 5 out of 5 and now plans to read The Dragon with a Chocolate Heart by Stephanie Burgis. This was an AMAZING book! I think the book awards books are getting better as I go along. The Explorer has adventure, humor and originality. My favourite character is Lila because she really likes animals and is kind and gentle. My favourite bit is when They find Bacca. Rosie gave The Explorer 5 out of 5 and now plans to read Just Call Me Spaghetti-Hoop Boy by Lara Williamson. I love this book because it is adventurous and about how children survive alone without adults. It has a bit of everything in it and teaches you tactics. Taya gave The Explorer 5 out of 5 and now plans to read Who Let the Gods Out? by Maz Evans. Elijah gave The Explorer 5 out of 5 and now plans to read Who Let the Gods Out? by Maz Evans. Drew gave The Explorer 5 out of 5 and now plans to read Who Let the Gods Out? by Maz Evans. Logan gave The Explorer 4 out of 5 and now plans to read Who Let the Gods Out? by Maz Evans. I recommend this book to readers who love thrill and adventure. My favourite character is Con she is a stubborn girl who likes to get her own way. This book in my opinion is aimed for girls and boys. I would read this book 10 times over without getting bored. Molly gave The Explorer 5 out of 5 and now plans to read The Boy with One Name by J R Wallis. I like this book because it gets straight to the point. It doesn't add unnecessary detail and has lots of twists. The main characters are Fred,Max,Lila and Con.They get stuck in a rainforest and with some help, they escape. The thing I don't like is that there is barely any Humor in it! A book can't be good if it has barely any Humor!I recommend this book to people who like cool designs, thick books, tiny words and serious books. Jakub gave The Explorer 4 out of 5 and now plans to read Who Let the Gods Out? by Maz Evans. The explorer was a very tense, exciting and a suspenseful book.I loved how there were many secrets that would be followed on if there would be a sequel. I'm not really a reader of adventure so I rated it 4 stars. I would recommend this book for fast readers as 400 pages can be a problem sometimes. Samir gave The Explorer 4 out of 5 and now plans to read The Dragon with a Chocolate Heart by Stephanie Burgis. This book i rate 5 out of 5 because at the end the is a twist and a mystery? ?.The auther used greate lanuage in this story as well as that the author has created a picture in my mind about a boy crashed, and all of a sudden there are random strangers that he meets on a island.So far,this is 1 of my favs! !.The bad thing is that it could do some work. Katija gave The Explorer 5 out of 5 and now plans to read The Dragon with a Chocolate Heart by Stephanie Burgis. The Explorer is a book about four children embarking on a journey to get home. Heart warming mommets are inclouded in this adventurous story . I recommend this book for children,who love adventure,that like exploring and finding new things. Fatiah gave The Explorer 5 out of 5 and now plans to read The Boy with One Name by J R Wallis. The Explorer is an extraordinary book, its jam packed with interesting chapters, and takes you on a journey into the Amazon Jungle. You will travel with an Explorer, and you will meet many different characters in the story. The chance of getting home is terrifying ,except it seems somebody has been there before them! I would recommend this book to imaginative and adventurous readers! Aaliyah gave The Explorer 5 out of 5 and now plans to read Who Let the Gods Out? by Maz Evans. I like this book because it is very adventurous.They meet this very weird person who likes to eat spiders. It also has different animals in it. I would recommend this book to year 4 students. Pratyush gave The Explorer 4 out of 5 and now plans to read Just Call Me Spaghetti-Hoop Boy by Lara Williamson. This book is amazing! It is by far my favourite one that I've read so far! I was hooked from the moment I started reading until the very last page. It is just one of those books that are just so amazing and gripping. It pulls you in. I would recommend you to read this book. You won't regret It!!! Lily gave The Explorer 5 out of 5 and now plans to read The Dragon with a Chocolate Heart by Stephanie Burgis. Caseybree gave The Explorer 4 out of 5 and now plans to read The Boy with One Name by J R Wallis. I liked this book but I felt like They skipped something out or they missed something. It is definitely one of my favourites so far. James gave The Explorer 5 out of 5 and now plans to read The Dragon with a Chocolate Heart by Stephanie Burgis. I think this book is really thasernating because I really like all the animals that the explorer finds and stuff so I would definitely recommend this to a lot of people. rhys gave The Explorer 4 out of 5 and now plans to read Letters from the Lighthouse by Emma Carroll. Fred is an upper-class boy and when his plane crashes in the jungle he is stranded with strangers will he ever return home? I rate it 3 because I loved the detail and action that it gives you to visualise a picture I would allow 7 or over to read. Freya gave The Explorer 3 out of 5 and now plans to read Just Call Me Spaghetti-Hoop Boy by Lara Williamson. It was good but I feel like there was something missing. Anya gave The Explorer 4 out of 5 and now plans to read Who Let the Gods Out? by Maz Evans. Jasmine gave The Explorer 1 out of 5 and now plans to read The Boy with One Name by J R Wallis. It is sad and exiting. The pot was very well done. I think loads of people would like it. Alice gave The Explorer 4 out of 5 and now plans to read The Boy with One Name by J R Wallis. I thought this book was awesome with lots of secrets. Millie gave The Explorer 4 out of 5 and now plans to read Who Let the Gods Out? by Maz Evans. It was very interesting. But I thought it was sad at the begening and also when there was a fire and a man died.I also found it very interesting when they got lost in the jungle and manged to escape. Rachelle gave The Explorer 5 out of 5 and now plans to read The Dragon with a Chocolate Heart by Stephanie Burgis. Olivia gave The Explorer 5 out of 5 and now plans to read Who Let the Gods Out? by Maz Evans. I loved this book,every time i pick this book up its glued to my hands. the story line is amazing and in the future if there were to be a sequel I would definitely get it. Milly gave The Explorer 4 out of 5 and now plans to read The Boy with One Name by J R Wallis. I really liked the setting because not many kids would be able to stay alive.Plus it gives a load off discription. Gabriel gave The Explorer 1 out of 5 and now plans to read Who Let the Gods Out? by Maz Evans. I think the book is amazing. The only reason I gave it 4 is at the start I didn't have clue what is going on. It would have been better if she started the action literally on the first line not letting you in slowly then bang it happens! But the upsides are it can really pull you straight into the book and be with the characters. I love the man they meet he is so strange but brilliant he is by far my favourite charecter. Freddie gave The Explorer 4 out of 5 and now plans to read Who Let the Gods Out? by Maz Evans. I didn't really like it very much because i dont love adventure stories,but I get the concept of it. Katherine Rundell is a good author but I dont really like her style of writing. If I could I would buy another one of her books and see if I like it more than this one. Evie gave The Explorer 2 out of 5 and now plans to read Just Call Me Spaghetti-Hoop Boy by Lara Williamson. The Explorer was one type of a different book to me as there was lots of tension and excitable moments throughout the book. I didn't really get the 'Explorer' character as he was very mysterious(which is a good thing! )and personally I think the story droned on a bit-I still enjoyed it though! I prefered the character Fred beacause he never made a fuss of anything and he was always ready to take a harder option even if it was the only one left.I only half recommend this book-it was good but probably wouldn't read again if had choice. Jake gave The Explorer 4 out of 5 and now plans to read Just Call Me Spaghetti-Hoop Boy by Lara Williamson. I looked this book because it was a book of action and adventure. This is a book for anyone because it is a tale of friendship and unexpected plot twists. Paige gave The Explorer 5 out of 5 and now plans to read The Dragon with a Chocolate Heart by Stephanie Burgis. An exiting story about the jungles beauty and its dangers .It is so good you cant put it down I rate it 4 out of 5! Francesca gave The Explorer 4 out of 5 and now plans to read The Dragon with a Chocolate Heart by Stephanie Burgis. This was the 5th Leeds Book Award book I read. I would have read The Explorer even if I didn't have to because the cover looked interesting. I loved it because you could easily picture the characters in your head and the descriptive language made it easy to read. I really enjoyed this book because it was a very interesting read and a very emotional one too. I felt it was more of a mature read than others so far because it was full of back stories that you had to think deeply into and the characters had very unique personalities and traits. My favourite character was the explorer because I liked how he wanted to look like he was doing fine on his own when actually, he was very lonely. All round a brilliant book and maybe one of my favourites. Sam gave The Explorer 5 out of 5 and now plans to read The Boy with One Name by J R Wallis. This is my favourite book so far.It is very emotional.Constantina aka Con had a very sad story.Fred was a relatable character as he liked cricket,like me.I wish I knew more about the characters.Katherine Randell has written a classic that will last as an amazing book for many years. Aum gave The Explorer 5 out of 5 and now plans to read The Boy with One Name by J R Wallis. LEO gave The Explorer 4 out of 5 and now plans to read The Boy with One Name by J R Wallis. I’m really enjoying this book so far.I can’t wait to finish it. I can’t put it down. So far my favourite part is where they find the city in the Amazon Jungle. Martha gave The Explorer 4 out of 5 and now plans to read The Dragon with a Chocolate Heart by Stephanie Burgis. I really like this book and my favourite character is Max because he is funny and he always threats to pee on you.I would recommend it to people who likes adventure.You should read The Explorer! Zara gave The Explorer 5 out of 5 and now plans to read The Boy with One Name by J R Wallis. Loweeza gave The Explorer 4 out of 5 and now plans to read The Boy with One Name by J R Wallis. I loved this book because it is full of action and adventure. I would recommend this book to anyone because it has lots of unexpected plot twists and has really interesting characters. Isobel gave The Explorer 5 out of 5 and now plans to read Letters from the Lighthouse by Emma Carroll. The book was very good. I never imagined that their plane would crash down, I just thought they would land in Manaus, go into the Amazon and explore with each other for the Amazon river. The reason I gave this book 5 put of 5 was because it was very thrilling and exciting. Definitely my favourite book so far! Sarah gave The Explorer 5 out of 5 and now plans to read The Dragon with a Chocolate Heart by Stephanie Burgis. Joe gave The Explorer 5 out of 5 and now plans to read Letters from the Lighthouse by Emma Carroll. My review on this book is that I really enjoyed it and gave it a 5 out of 5 because you always wanted to read more and you just could not put it down. The book was really good and what made it even better was that there was 400 pages of brilliant writing. it took me a while to read but it was worth it. I loved the bookand would recommend it to anyone who has a good imagination. Isaac gave The Explorer 5 out of 5 and now plans to read Who Let the Gods Out? by Maz Evans. After an Aeroplane crash, landing in the middle of the Amazon rainforest, Fred, Con, Lila and Max must learn to survive in the vast jungle. When they stumble into a ancient city,that has been hidden away for centuries, they realise that they are not the first people to have set foot there...I really liked this book, as it builds its own world of colour, adventure and imagination in your mind and definitely deserves 5 stars from me! Megan gave The Explorer 5 out of 5 and now plans to read The Boy with One Name by J R Wallis. the explorer is my favourite one because it seems so real and the characters bond during the journey.i'll probably vote for this one. Seren gave The Explorer 5 out of 5 and now plans to read Just Call Me Spaghetti-Hoop Boy by Lara Williamson. The Explorer is a fantastic book with a great setting description. Some parts of the book are really good but the build up sometimes drags on a bit. Once or twice have felt like the end of the build up slowly looses it's meaning. Eryn gave The Explorer 3 out of 5 and now plans to read Who Let the Gods Out? by Maz Evans. The Explorer is about some kids getting lost in the jungle and trying to get home. This story is O.K but is a little predictable. Thomas gave The Explorer 3 out of 5 and now plans to read The Boy with One Name by J R Wallis. WOW!!!! This book is amazing.I liked the character Con the best because he is really funny .The Explorer is very adventurous and has some interesting chapters.In the Explorer you can never put the book down and it was NEVER boring.I rate this 5 out of 5. Fergus gave The Explorer 5 out of 5 and now plans to read The Dragon with a Chocolate Heart by Stephanie Burgis. I really enjoyed this book,it has a lot of cliff hangers and i like how the author describes everything in detail. My favorite character would have to be Con because there are two sides to her, she can be quite stubborn and likes things to be her way and also there is quite a sad side to her when you find out about her family. I also like Baca because sloths/baby sloths are so cute .One of my favorite parts was at the end when they went to London and met up and then baca was at the meeting .It is my favorite book so far !!!!!!!!!! Lois gave The Explorer 5 out of 5 and now plans to read Just Call Me Spaghetti-Hoop Boy by Lara Williamson. I absolutely loved this book and it has been my favourite book so far.It was shuch a page turner and i couldn't stop reading it.Every chapter got more interesting and made you want to read more .One of my favourite things about the book was the characters and there are some suprize characters in the middle if the book.If this book was part of a series i would definitly read them all .It was a quick read partly because i could not stop reading it.I would recomend it to anyone who enjoyes adventure books.What was really cool was the chapter pages because it had a picture surounding the wrighting .Over all this book in my opinion was amazing and i enjoyed it all.The .What i really enjoyed was how well she described there suroundings. Esmae gave The Explorer 5 out of 5 and now plans to read Just Call Me Spaghetti-Hoop Boy by Lara Williamson. I really like Lila because I love the fact that she likes animals. I also like Max because he picks his nose [Urrrrrr]!I also like Fred and Con, I like Fred because he is courageous, he climbs trees, and he learns to fly a plane in 1 and a half days [roughly] to save Max from dying. I also like Con because she goes from being silent and aggressive to being helpful, kind and still pretty aggressive. Mae gave The Explorer 5 out of 5 and now plans to read Letters from the Lighthouse by Emma Carroll. I really like this book. My favourite character is Fred because I like the fact that he is adventurous . I recommend this to anyone who likes adventure books. Jessica gave The Explorer 3 out of 5 and now plans to read The Boy with One Name by J R Wallis. I really liked the book. It was very adventurous so i could not put it down. My favourite part was when they went home. lelannah gave The Explorer 5 out of 5 and now plans to read Letters from the Lighthouse by Emma Carroll. I really enjoyed The Explorer,at first I wasn't sure I would enjoy it as it is not something I would choose for myself. My favorite chapter is called The Explorer, like the book. This story keeps you guessing about what's going to happen. I would recommend this book to anybody from year 4 onwards. Zainab gave The Explorer 5 out of 5 and now plans to read Just Call Me Spaghetti-Hoop Boy by Lara Williamson. I really enjoyed this book it was very exciting and in some parts it was very tense when there was a problem. My favourite character was Con as she was very quiet at first then she grew to be a loud character.This book was very good. I do recommend this book to people who like reading about adventures. lanney gave The Explorer 5 out of 5 and now plans to read Letters from the Lighthouse by Emma Carroll. The Explorer is a very adventurous book and has many interesting chapters. When you first start reading, you don't really know what is going on, as this is the type of book that wants you to keep on reading. I would recommend this book to people that love adventures. The thing I love about this book is that there are many unexpected moments. Imaani gave The Explorer 4 out of 5 and now plans to read The Boy with One Name by J R Wallis. I think The Explorer is an amazing book which will intrigue you.When you read this book you won't be able to put it down because it is so good! Alex gave The Explorer 5 out of 5 and now plans to read The Dragon with a Chocolate Heart by Stephanie Burgis. So far I am loving this book it is full of adventure. My favourite character is Max because he is the funniest especially when he threatens to wee on someone. I am at the part where they find the explorer he is not an explorer though. I would reccomend this to people who like adventure books. It is full of it!! Ben gave The Explorer 5 out of 5 and now plans to read Letters from the Lighthouse by Emma Carroll. Dania gave The Explorer 5 out of 5 and now plans to read The Boy with One Name by J R Wallis. Naushin gave The Explorer 4 out of 5 and now plans to read The Boy with One Name by J R Wallis. I abseloutley loved this book it was full of excitement and there were some really good intense chapters. My favourite character was Fred because he was very brave when confronted with a challenge. I also liked how detailed the description of nouns are. Oscar gave The Explorer 5 out of 5 and now plans to read The Boy with One Name by J R Wallis. I enjoyed some parts of the book but not all of it. I think i would probably read this book when im a bit older. I think it was a bit innapropriatte in some parts of the boof speaking about things like tobacco. I didnt like how they used an idea about pihrannas twice as they were quite similar. Kara-Leigh gave The Explorer 3 out of 5 and now plans to read The Boy with One Name by J R Wallis. This is a very good book BUT I would suggest that this book shouldn't sware because if younger kids were reading this book then they might copy the swares and then say them. Apart from that,I absolutely loved this book and the amazing language, illustrations and characters. I LOVED THIS BOOK SOOOOOOOOOOO MUCH. Matilda gave The Explorer 4 out of 5 and now plans to read Just Call Me Spaghetti-Hoop Boy by Lara Williamson. I really like this book because it tells you all about animals and I am a big animal fan. I like it when the Explorer helps Fred, Con, Lila and Max and gives them tips of how to survive in the wild. It is very comforting at the end but you'll have to read to find out what happens. THIS IS AN AWESOME BOOK! Sky gave The Explorer 5 out of 5 and now plans to read Just Call Me Spaghetti-Hoop Boy by Lara Williamson. I really enjoyed this book because I liked the way the characters slowly created a friendship whilst trying to survive. I also like the way the author has described the jungle ( my favourite description was about the river). It also had a slow creation of independence while they were in the wild. Lily gave The Explorer 4 out of 5 and now plans to read The Boy with One Name by J R Wallis. It is one of the most greatest books ever. I love how colourful the front page and if somebody red the blurb they would say WOW I want to read this. All of my other books I don't read now because I all ways read this and I am know nearly finest!!!!!!!! Lucy gave The Explorer 5 out of 5 and now plans to read The Dragon with a Chocolate Heart by Stephanie Burgis. I recently read this book. The main characters are Fred, con, two Brazilian siblings named Lila and Max and finally the explorer. I like Con the best as she does not like the jungle at first but later on in the story she gets to like the jungle and the explorer. They are forced to survive in the jungle after their plan crashes. For days they had to survive until Fred finds a map that leads them to a ruined city and a secret. I really like the book and recommend it to ages 9 and over. Adam gave The Explorer 5 out of 5 and now plans to read The Boy with One Name by J R Wallis. #This book is awesome! I would totally recommend it! 100% 5/5 GOLD stars. You will totally like this book. Its all about 4 kids lost in the Amazon. Do you think that they can escape from all of the dangerous animals? I would recommend this book for 9-13 year olds; even though it is aimed at kids aged 9-11. I won't spoil too much for you. I hope you really like this book. If you love animals this is the absolute PERFECT book for you! Just like me I love animals. Hope you enjoy this book. GOODBYE! Natasha gave The Explorer 5 out of 5 and now plans to read The Boy with One Name by J R Wallis. This book was very funny at the beginning. The more I read the less I could understand.The Explorer is not my type of book as it made me confused but do not let me ruin it for any of you readers out there. Zena gave The Explorer 3 out of 5 and now plans to read Letters from the Lighthouse by Emma Carroll. If I am honest, I didnâ€™t enjoy the book at all. I couldnâ€™t get into it it is not my type of book. I was reluctantly reading. I rate this book 2 because it probably took a lot of effort. I recommend this book for people who like Bear Grills, survival skills or living in the jungle. Isabel gave The Explorer 2 out of 5 and now plans to read Just Call Me Spaghetti-Hoop Boy by Lara Williamson. i really liked this book because i liked how max,Fred,Lila and con have epic adventures through the Amazon rain forest. Their adventures are a bit of everything like humor,adventure,drama and more!!!! i would recommend this book for anyone who likes anything!!!!!! arthur gave The Explorer 4 out of 5 and now plans to read Letters from the Lighthouse by Emma Carroll. This is the best book out of all of them! 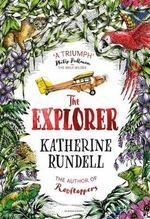 This book has everything from humor to adventure,excitement to happiness.When a plane crashes Fred,Lila,Max and Con have to survive in the Amazon jungle of all places.This book is worthy of the prize definitely because Katherine Rundell has done so well writing this book.Truly amazing story! Peter gave The Explorer 5 out of 5 and now plans to read The Boy with One Name by J R Wallis. Rudee gave The Explorer 4 out of 5 and now plans to read The Boy with One Name by J R Wallis. This book was amazing and very inspiring. Best book ever!!!! Liliana gave The Explorer 5 out of 5 and now plans to read The Dragon with a Chocolate Heart by Stephanie Burgis. Great! This book doesn't waste any time and gets straight into the action. The characters get stuck in the jungle with no way out...until they meet him. Tension,emotions and great characters, created a book which I now love! Sophia gave The Explorer 4 out of 5 and now plans to read Who Let the Gods Out? by Maz Evans. this book has a great descriptive style and has an amazing plot my favorite character was probably baca the sloth.The explorer was a tad meaner than I was expecting. I like that at the end they go to the ritz in london and they secretly took baca. callum gave The Explorer 5 out of 5 and now plans to read Who Let the Gods Out? by Maz Evans. I thought that this book had a very good storyline and kept you captivated through the entire book. The author also had a good knowledge of all the animals in the Amazon which added to the atmosphere of the book. I also liked how she focused on all the characters rather than just one. Fran gave The Explorer 5 out of 5 and now plans to read The Dragon with a Chocolate Heart by Stephanie Burgis. A book full of adventure! I absolutely loved it,especially the bit where the children in this book got to all be explorers when they grew up! Layla gave The Explorer 5 out of 5 and now plans to read The Dragon with a Chocolate Heart by Stephanie Burgis. This my favourite book so far because it is very funny.My favourite character is Max because he reminds me of my own little brother. Rose gave The Explorer 5 out of 5 and now plans to read The Boy with One Name by J R Wallis. I loved this book because it was full of nature. I could not put it down. 4 children are alone in a rainforest because there plain crashed. They had to learn how to survive and how to get out of this place. It seems someone had been there before them but who? How will they get home to there family? I would recommend this book for ages 9+. Skye gave The Explorer 5 out of 5 and now plans to read The Dragon with a Chocolate Heart by Stephanie Burgis. I loved this book because i adore nature and adore animals. i had different emotions at different times like when Max was really poorly i was worried that he might die. Lilyanna gave The Explorer 5 out of 5 and now plans to read Letters from the Lighthouse by Emma Carroll. I thought that this book was exiting and a real page-turner. I liked the Explorer's role in the book and I was touched by his background story. My only criticism is that I thought the Explorer could have been introduced a little earlier seen as though it is the title of the book. Overall it was a good read and I would recommend it to people who like adventure stories! Matthew gave The Explorer 5 out of 5 and now plans to read The Boy with One Name by J R Wallis. â€˜The Explorerâ€™ Kept me intrigued from start to finish. I really enjoyed this adventurous book because it shares different emotions and keeps you on the edge of your seet. I would recormend this book to someone who enjoys exiting tales and someone who has the ability in them to put theyâ€™re book down. Layla gave The Explorer 4 out of 5 and now plans to read The Dragon with a Chocolate Heart by Stephanie Burgis. I really enjoyed this book and Iâ€™m glad I read it! Fantastic! Katherine Rundell described the backdrop of one of the most beautiful places in the world magically. The plot twist at the middle was seamless, and worked well with the simple writing style. I also loved it because of how realistic it was compared with other survivalist books. Lauren gave The Explorer 5 out of 5 and now plans to read Who Let the Gods Out? by Maz Evans. Hadiqah gave The Explorer 5 out of 5 and now plans to read The Boy with One Name by J R Wallis. I have finished the explorer and it is really interesting and would recommend it to children who love nature. Kashmithra gave The Explorer 4 out of 5 and now plans to read Letters from the Lighthouse by Emma Carroll. A book full of adventure!I absolutely love this! I would definitely recommend it to anybody just starting to read it! I dislike this book. The reason for this was because the book was about a plane crash which landed in the amazon rain forest.Then these children (who were on the plane) had to survive. However I almost finished the book and they still were trying to get of the jungle. Jaskiran gave The Explorer 2 out of 5 and now plans to read Just Call Me Spaghetti-Hoop Boy by Lara Williamson. I really like this book because it is an adventurest book and i like adventue books.It is when a plane crashed into a random island so thats why I would recomend this book to anyone that likes adventure books. Amina gave The Explorer 4 out of 5 and now plans to read The Boy with One Name by J R Wallis. i would recommend this book to people who likes adventure because it is an amazing story that you can't stop reading . at first i found it boring but as i got further it got better . its about a group of people who go on holiday and the areoplane crashes in a jungle . they have to find their way out and they come across crazy adventures . yousuf gave The Explorer 5 out of 5 and now plans to read The Boy with One Name by J R Wallis. This book is very clingy to read. The writing style is very interesting to read. However, some of the chapters dont sometimes make sense and you get kinda lost. Other than that, the book itself is very nice! Ravneet gave The Explorer 4 out of 5 and now plans to read Who Let the Gods Out? by Maz Evans. I enjoyed this book because, like Fred,I love exploring. It was intresting to see how children like me survive in a jungle. My favourite character was Abacaxi because he's so cute and small. It was very exiting to read. Caitlin gave The Explorer 4 out of 5 and now plans to read Who Let the Gods Out? by Maz Evans. I really liked this book and it made me want to read on!! This book is about a boy called Fred and he wanted to be an explorer. He was going on holiday and was flying over the Amazon Jungle. Suddenly the plane crashed but he survived. He started to run and fell over a rock, hit his head and he got up and a burning branch fell and knocked him out. When he woke up he was surrounded by children. I liked how Fred wanted to be a explorer. My favourite character was Lila because she was not scared of anything. The part that made me laugh was when Fred kept getting hit by the branches. Bailey gave The Explorer 5 out of 5 and now plans to read The Dragon with a Chocolate Heart by Stephanie Burgis. Brooke gave The Explorer 3 out of 5 and now plans to read The Boy with One Name by J R Wallis. I loved this book because it makes you feel like your in it. once you start you cant stop!this book was excellent, although it had a slow start. it shows you how life would be like in the wild. RORY gave The Explorer 4 out of 5 and now plans to read Just Call Me Spaghetti-Hoop Boy by Lara Williamson. I enjoyed this book due to the funniness,drama and the unusual plot.I strongly feel that the characters could have had a slight bit more description,otherwise it was very good.The setting had me gripped from the beginning...I loved the plot, a bunch of kids stuck in the rain-forest,it sounded seriously entertaining!My favorite part was when they found the explorer;I found him mysterious- like he was meant to have been found.This book inspires 9-11 year olds to go on adventures. "Like a man made wish, the aeroplane rose into the sky.It didn't stay there for long." This phrase left me enthralled with curiosity. I would recommend this book to anyone/everyone. This book deserves 4/5 stars;I strongly feel the story will not ever be forgotten by the people who read it :). This book fills the reader with excitement,wonder and nerves. Why not read The Explorer today? Molly gave The Explorer 4 out of 5 and now plans to read The Boy with One Name by J R Wallis. I enjoyed this book because it was quite funny also the characters could of had a bit more description . I loved the part when they found the explorer because he was very mysterious and weird . My favorite character was Max because he was really annoying and stupid . Another reason why i gave it 4 out of 5 is because i like that when the plane crashed that they were the only people who survived and also that they were all children . Idalia gave The Explorer 4 out of 5 and now plans to read The Boy with One Name by J R Wallis. I loved this book lots and it gave me lots of curiosity and wonder. The characters were very mysterious at first but I started to like them. This book for me is going to be very hard to beat. All of the book made me feel very calm and I couldn't leave it alone it was one of the books I was engrossed in. David gave The Explorer 5 out of 5 and now plans to read The Boy with One Name by J R Wallis. I liked the explorer because it was very funny and they were a a lot of challenges like them finding shelter an climbing the cliff. I also liked that the Explorer went from mean to nice he became nice when he opened up about his past like his wife and son died and that max looked like his own son. Jasmine gave The Explorer 4 out of 5 and now plans to read The Boy with One Name by J R Wallis. I rated this book a 4 because the book has a sense of adventure around every corner also I liked the characters having different skills so they could join together as a team and get out of the Jungle. The book could improve on description on characters and description of the setting. Ethan gave The Explorer 4 out of 5 and now plans to read The Boy with One Name by J R Wallis. The Explorer is a great book. I think it is the best book I have read so far (in the book awards, not ever :D) I give it a 4/5. I think that this book is for 9-13 year olds. Jeff gave The Explorer 4 out of 5 and now plans to read The Boy with One Name by J R Wallis. This book is the perfect book because I love adventure books and I love all the description and how Fred found a boy called max, Con and Lila and there personality's so I would defiantly rate this five out of five stars. Lacey gave The Explorer 5 out of 5 and now plans to read Just Call Me Spaghetti-Hoop Boy by Lara Williamson. The explorer is a very good book. It took a while to get into but after that it was amazing. My favourite character is con because on the outside she is a very sassy girl but on the inside she is actually very nice. I liked the Illustrations as they really related to the chapters. Overall I think it is a great book and I recommend it to any readers who like adventures and cliffhangers. Isabelle gave The Explorer 4 out of 5 and now plans to read The Dragon with a Chocolate Heart by Stephanie Burgis. I loved this book because it builds a world in your head that`s full of colour and where anything is possible.I also like it because the characters have to learn to get along despite their different personalities. Ava gave The Explorer 5 out of 5 and now plans to read Letters from the Lighthouse by Emma Carroll. I really liked this book because it is about the Amazon and I would like to explore around the amazon one day also I like it because it makes me imagine how it would feel like to be in a jungle or a rain forest. Elisabeth gave The Explorer 5 out of 5 and now plans to read Just Call Me Spaghetti-Hoop Boy by Lara Williamson. I really enjoyed this book. M favorite bit was when they met the explorer and I loved how they started near the Amazon river . Elisabeth gave The Explorer 5 out of 5 and now plans to read The Boy with One Name by J R Wallis. This is my first choice of a book and I actually really loved it my favourite quote from con(a character in the book )was "I am con,it's short for Constantia but if you call me that I'll kill you". I picked this book because even though it has lots of pages I looked at the words and read the first chapter and couldn't stop until I bumped my head on a lap post outside. I would recommend this to anyone who likes adventure. My favourite character is max. Shelly gave The Explorer 5 out of 5 and now plans to read The Boy with One Name by J R Wallis. This was my first choice from the shorlist and I am only started, I am really enjoying it and would recommend it to people who like adventure. When four young children - Fred, Con, Lila and Max - crash-land in the Amazon jungle,they face many dangers that many would never dream of a confrontation with. Thousands of miles from their different homes, can any of them survive long enough to find a way home? The Explorer was an inventive masterpiece; however, I couldn't imagine how four children, none of them any older than twelve could be left alone in a plane with a complete stranger. Alex gave The Explorer 4 out of 5 and now plans to read The Dragon with a Chocolate Heart by Stephanie Burgis. I really enjoyed this book and my favourite character was con. Hannah gave The Explorer 5 out of 5 and now plans to read The Dragon with a Chocolate Heart by Stephanie Burgis. This is a thoroughly enjoyable book, one of the best I have ever read. I would highly recommend it for children aged 9+. Lucy gave The Explorer 5 out of 5 and now plans to read Letters from the Lighthouse by Emma Carroll. charlie gave The Explorer 1 out of 5 and now plans to read Who Let the Gods Out? by Maz Evans. The Explorer - " such an amazing book"
The Explorer is an amazing book about 4 children that go on a plane ride but the plane crashes into the Amazon and they are stuck there alone or are they...? My favourite part in the Explorer is when they find the ruins of a lost city and when they find the man that they call the Explorer. The oldest one from the group is Fred, the two girls names are Con and Lila and the youngest is called Max. Max is Lila's brother and Con and Fred are only young children. I would rate this book 5/5 because it is a brilliant read and has outstanding pictures. I would say the reader could be a 9-14 years old because it has a few tricky words. It does hook you in so you start to think will they get out of the Amazon alive. If they do how? Read it yourself to find out! Evie gave The Explorer 5 out of 5 and now plans to read Just Call Me Spaghetti-Hoop Boy by Lara Williamson. The Explorer is about four children who have to stay in the Amazon Jungle because the airplane they were traveling on, crashed. â€œLike a man-made magic wish, the airplane rose into the sky. It didn't stay there very long.â€ The children find a hidden city where they find a mysterious man who they call the Explorer, will he help them escape or will he leave them to die? Fred is 12 years old, he is very clever. In the story he makes a raft. He is very calm yet sometimes he gets angry mainly with the Explorer or Con. I like Fred because he is funny and he likes to explore the jungle. Con who is 12 has a strong temper and she can be stubborn, but she normally gives in yet she is never really sure if it's the right choice. I like Con a lot because she has a strong will and is normally right but she can be wrong! Lila is 12 years old, she is protective over her younger brother Max. Lila is not very loud but is clever especially with animals. She adopts a sloth called Baca. My favorite character is Lila, she never argues and is always doing something useful like cooking or telling Max what to do. Max is 5 and gets upset when he doesn't get what he wants which is mostly everything to do with food apart from eating scorpions! The Explorer was a pilot but then his plane crashed, will it get repaired or not? He likes Max because he reminds him of his son who died! The Explorer doesn't tell the children a lot about himself but he asks a lot of questions about the children and gets them answered. In my opinion he is very suspicious, secretive and disturbing. I give this book 4 out of 5 stars because sometimes it has too much description and not enough plot. I think this book has a lot of action in it so it makes it really exciting, it is funny and is an unforgettable adventure! Fiona gave The Explorer 4 out of 5 and now plans to read The Dragon with a Chocolate Heart by Stephanie Burgis. I thoroughly enjoyed it. I thought it was better than the other book I read because I thought it had a better storyline unlike the other one. My favourite part is when they found the explorer in the lost city. I think the explorer is a bit weird but I understand why he is like that. Hamna gave The Explorer 5 out of 5 and now plans to read The Dragon with a Chocolate Heart by Stephanie Burgis. This book was amazing, it was action packed and full of adventure.I would recommend this book to anybody who would consider reading it.My favorite character was Con she is serious but can loosen up quite up a bit but all the characters were really well detailed and you could really imagin what they looked like. When you are reading be ready for a lot of impact as you are in the Brazilian rain forest. Samantha gave The Explorer 4 out of 5 and now plans to read The Boy with One Name by J R Wallis. The Explorer is an amazing book. It is intriguing, engaging and incredible. I love the description.There are 6 characters in the book:Con, Lila, Max, Fred, The Explorer and Baca (an adorable sloth). I definitely recommend the book to everyone aged 9+ (due to some disappointing language).Although it may have some bad words it is an marvelous book. Lucy gave The Explorer 5 out of 5 and now plans to read The Boy with One Name by J R Wallis. Isabelle gave The Explorer 5 out of 5 and now plans to read The Boy with One Name by J R Wallis. This book is really interesting. When you read a bit it always makes you want to read more. Katherine is an amazing author and uses lots of description in her writing. The only thing which disappointed me was the end because she used fantastic description all the way through but at the end she kind of rushed it.I recommend this book for 10 and over because of some of the language. kelsey gave The Explorer 5 out of 5 and now plans to read The Boy with One Name by J R Wallis. WOW!This book is incredible! I love the characters in this and their personalities and you can really picture what the atmosphere is, what they are feeling etc.I would definatly recommend this book and I give it a huge 10/10! Vicki gave The Explorer 5 out of 5 and now plans to read The Boy with One Name by J R Wallis. This book is an amazing book and the characters in this book are:Max,Con,Fred and Lila.This is a good read and I would recommend to others, in year 5 and 6.My favorite character is Bacca the sloth because he is so cute! Emily gave The Explorer 4 out of 5 and now plans to read The Boy with One Name by J R Wallis. The book "The Explorer", was probably one of the best books I've ever read. It started with 4 Children: Con, Lila, Max and Fred flying in a plane in the Amazonian Rain Forest, the pilot suffered a heart attack and crashed. Later on, they have to survive in the warm grounds of Rio. I rated this book 5/5 because I couldn't get my head out of it. It was long, but that was a good thing, I would recommend this book to children my age! I loved this book because it was exiting and cool.My favourite character was Con because she was funny and silly I also loved how they rescued a baby sloth from the vultures and looked after it.. I think its a little sad though because they are away from their parents. Lily-Rose gave The Explorer 4 out of 5 and now plans to read The Dragon with a Chocolate Heart by Stephanie Burgis. the blurb was very short but also very detailed. I really liked the explorer because it was really interesting. As soon as I opened this book I want to put it down I was determined to read it I recommend the next person to read The Explorer. Irish gave The Explorer 5 out of 5 and now plans to read The Dragon with a Chocolate Heart by Stephanie Burgis. I thoroughly enjoyed this fiction book because I was intrigued by the interior, I thought it was very interesting; when they crashed into the Amazon jungle, they were forced to band together in the survival, and burning hot jungle. Every time I open this book, I feel like I am in a Amazon jungle. Every time I am on a new page I am determined to get onto a new one. I would strongly recommend this book to people who love adventures. Theo gave The Explorer 4 out of 5 and now plans to read Who Let the Gods Out? by Maz Evans. The Explorer was a hair-raising novel with positive characters and detailed illustrations. Every page I read made me more determined to read on. As I read this book I felt as if I was there with Fred and the others. Out of all the characters, I mostly admired Max because he was an amusing and mischievous child that always got into trouble. Zuzia gave The Explorer 5 out of 5 and now plans to read Who Let the Gods Out? by Maz Evans. The Explorer was a heart-stopping novel, that made me more intrigued to turn every page. This book has helped me to extended my imagination and I could just picture every moment of the book. All the characters were strong-minded,brave and when they were in the jungle, I felt like I was there with them. I admired Baca more than anyone in the story because I love sloths.I would definitely recommend this book because it will take you on a magical journey to the Amazon. Maisie gave The Explorer 4 out of 5 and now plans to read The Dragon with a Chocolate Heart by Stephanie Burgis. I think this is one of the best books I have ever read. I am so glad the author did this book in a child's perspective it made it relatable and amazing. I thought this showed a spectacular plotline with great secrets and mysteries. This book has intrigued me in and made me engulfed in this book. I think this definitely deserves 5 stars, it has been funny, interesting and packed full of adventure. I would recommend this to everyone I know who enjoys adventure, mystery and great books. I hope the author keeps this fantastic work up I wish to read more of her work soon. Megan gave The Explorer 5 out of 5 and now plans to read Just Call Me Spaghetti-Hoop Boy by Lara Williamson. I love the way Max says everything is his [like when he says the explorer is his]and Lila is like a little pixel biologist. Sama gave The Explorer 5 out of 5 and now plans to read The Boy with One Name by J R Wallis. This is an incredible book with outstanding vocabulary! When their plane crashes in the middle of the Amazon, Fred, Lila, Max and Con are forced to eat and do things they never would at home. But, something seems fishy. It seems somebody has walked in these parts before. And not just anybody. An explorer! This is an incredible book for all ages with such good vocabulary, I could almost taste, feel, hear, see and smell everything! I would recommend this to anybody I know!! Hollie gave The Explorer 5 out of 5 and now plans to read Who Let the Gods Out? by Maz Evans. This is an amazing novel with captivating illustrations, strong-minded characters and a story line that really hits home. When their aeroplane crashes in the middle of the Amazon jungle, Fred, Lila, Con and Max are forced to band together in the fight to survive. As the group head out on their journey to Manaus and civilisation, they realise something - someone has walked this path before. Can they find this strange explorer in whose footsteps they are following? Will they ever get home? Johnny gave The Explorer 4 out of 5 and now plans to read Letters from the Lighthouse by Emma Carroll. This was an outstanding novel with great vocabulary and writing skills and some beautiful illustrations. This was a book that showed true friendship and team work. It also displays a lot of anger and annoyance of when not using team work and communication skills.It is about 4 total strangers who unfortunately crashed in an airplane, and ended up being the best of friends anyone could ever be, and like they were family. It was truly touching, and I couldn't bear to put the book down. I would give this a big,fat 5 out of 5 , and would highly recommend it to kids who like to read adventure stories or books about friendship. I really enjoyed the book . I found it easy to read. My favourite character must be the explorer because of the way he acts and what he does. I would definitely recommend this book. Farhanah gave The Explorer 5 out of 5 and now plans to read The Dragon with a Chocolate Heart by Stephanie Burgis.